Billie Eilish wants to know: WHEN WE ALL FALL ASLEEP, WHERE DO WE GO? 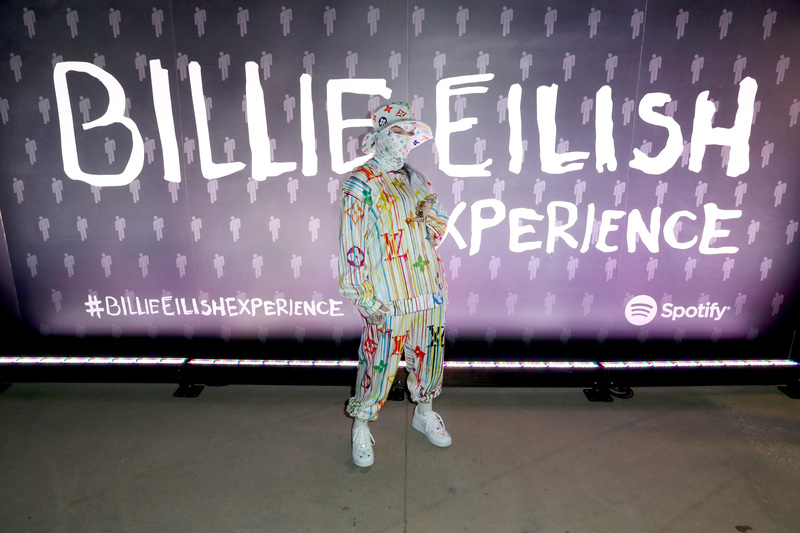 To find the answer, fans can embark on a journey through her strange world via Spotify’s Billie Eilish interactive experience, created in honor of her debut album released today. 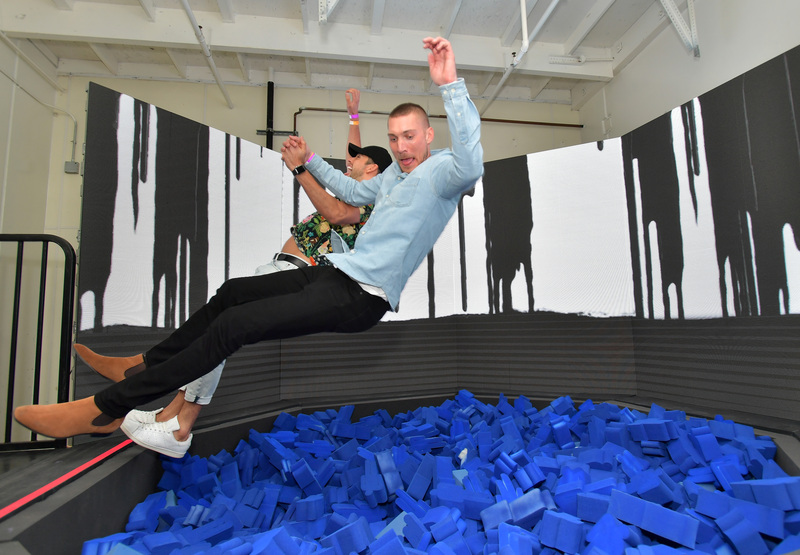 Located in downtown Los Angeles, the activation launches for her fans today and will be open to the public for three days through Sunday, March 31. Step inside and see each song from WHEN WE ALL FALL ASLEEP, WHERE DO WE GO? come to life as part of an immersive journey through Billie’s mind. Read on below for a room-by-room rundown—though when it comes to a Billie Eilish experience of any kind, you might have to see it to believe it. 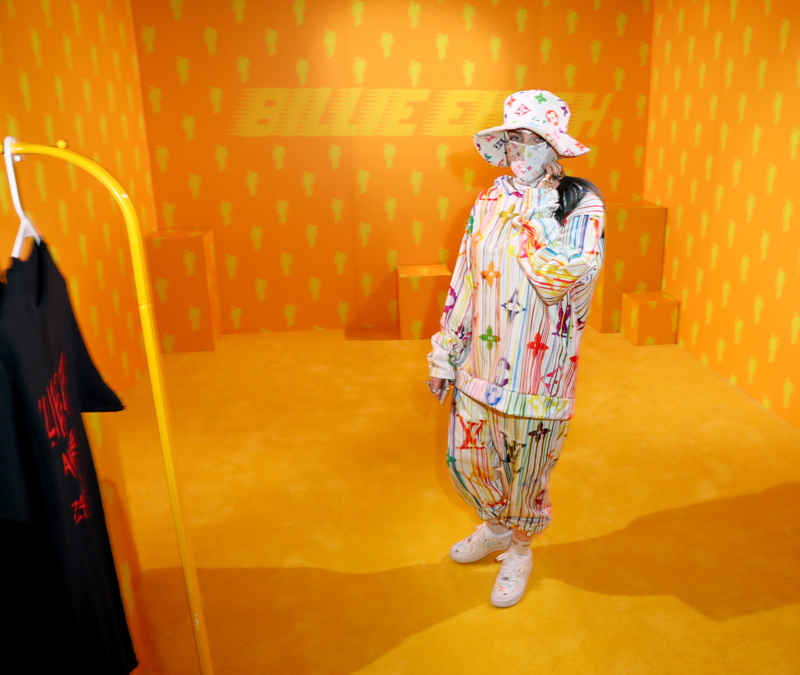 Enter Billie’s world through a room inspired by the album’s opening track, “!!!!!! !” Check in and place your items on a conveyor belt that passes through an invisalign-clad mouth sculpture built into the wall. Leave all your personal thoughts and feelings aside: You’re about to begin your adventure. You’ll first meet a group challenge. While Billie’s “bad guy” track plays over speakers, you’ll drive a remote control race car through an obstacle course filled with cookie dough mountains and vegan milk waterfalls. The winding track holds the key to your next room. Hold tight—the “xanny” room is brimming with lights, fog, and vibrating furniture. Keep your cool as the entire room vibrates beneath your feet. The world of “you should see me in a crown” is brought to life as you crawl through a web to get to the spider’s lair. Inside, among cold chains and videos of spiders in their most natural state— breeding, mating, spinning webs—you’ll find the Murakami crown from the video. Arachnophobes, beware. Get ready to descend into the underworld. The experience heats up for “all good girls go to hell,” where you’ll find yourself surrounded by LED flames and scorching floors. “wish you were gay” invites fans to take a whiff inside a room inspired by Billie’s latest earworm album single. Blohsh cutouts are scattered throughout the room to step on, touch, and even sniff each different scent to find the one you connect with. The party might be over, but there’s still plenty of room in the pit. Jump in to the tune of Billie’s melancholy ballad “when the party’s over” and lose yourself inside a foam abyss. Billie’s jet-black tears ooze from the walls above. Need a lighthearted escape from the sea of dark tears? Kick back with some adorable pups, each of which can be fostered as part of the Billie-supported Marley’s Mutts scheme. These four-legged friends will wander around the soft, fluffy “8” room, ready to pounce and play with you while images of Billie playing with puppies as a child fill the walls. Sign up to donate or foster a dog with a Marley’s Mutts representative onsite. In honor of “my strange addiction,” feel free to indulge in the not-so-guilty pleasure of crafting. Inside a deep-red art studio, decorate your own foam blohsh to add to a mini-forest diorama of blohshes. The spooky, minimal beats of “bury a friend” pulse through this room. Climb under Billie’s giant bed to find the monsters buried underneath through a seeping darkness-to-light contrast. Uncover the invisible-ink messages hidden in the shadows. Take a dip underwater in the “ilomilo” room, where fake seaweed, a bubble machine, and blue cubes create a subaquatic experience. Partner up with your friend to find the hidden blohshes. In the next room, you’ll take a trip to the skies by climbing out a plane window. 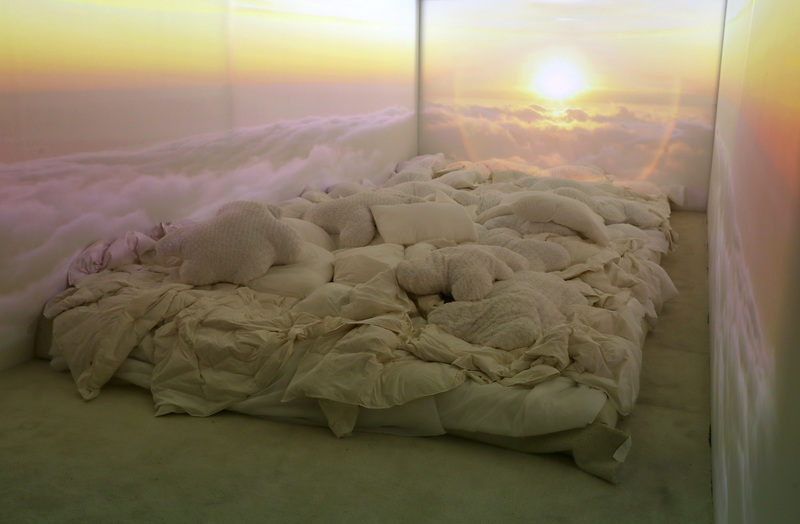 Then, lie among the clouds to experience “listen before i go.” This space-inspired space features cloud projections and props like mattresses, pillows, and duvets to create a heavenly area in which you can recline, relax, and watch the world go by. We’ve recreated Billie’s beloved red bedroom for “i love you,” where you can tell Billie the ways in which she’s inspired you. Use a tablet to write your note, which is then projected onto the walls. Our wonderful journey concludes in the “goodbye” room, a prismatic maze with shifting colors, as Billie says a fond farewell to each of her visitors. To further support the album launch, Spotify will create a brand new multimedia playlist for WHEN WE ALL FALL ASLEEP, WHERE DO WE GO? allowing for exclusive video content and new product features to enhance the on-platform fan experience. 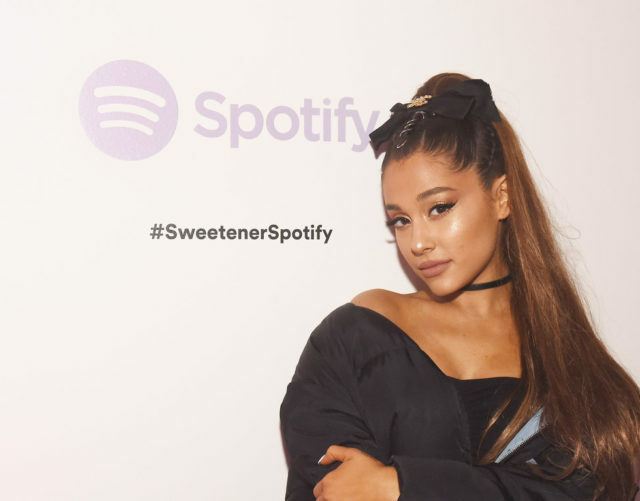 This playlist will allow for vertical video content, custom assets, and editorial storylines all with the goal of creating more meaningful and engaging context for Billie’s fans. Stream Billie Eilish’s groundbreaking new album here. Nadia Dies. Nadia Lives. ‘Gotta Get Up’ Plays. Users Repeat.